The Dominican Republic has joined the growing list of countries who have ditched diplomacy with Taiwan following diplomatic pressure by China. This leaves Taiwan with just 19 diplomatic allies, many of them small states in South America with limited economic ties to China. The relationship between China and Taiwan has soured since Tsai Ing-wen was elected as President of Taiwan in 2016 and due to rapid economic and political growth and ruthless crackdown of internal dissent China has been able to pressure Taiwanese allies into switching sides. The Dominican Republic has established diplomatic relations with China and cut its ties with Taiwan. Taiwan has said that it is "deeply upset" by the Caribbean nation's decision, which deepens its diplomatic isolation. The governments in Beijing and Taipei insist that countries cannot recognise both of them. China regards Taiwan as a breakaway province. Taiwan is now left with only 19 diplomatic allies. The island's foreign ministry said the Dominican Republic had accepted "false promises of investment and aid by China". Taipei also "strongly condemns China's objectionable decision to use dollar diplomacy to convert Taiwan's diplomatic allies". 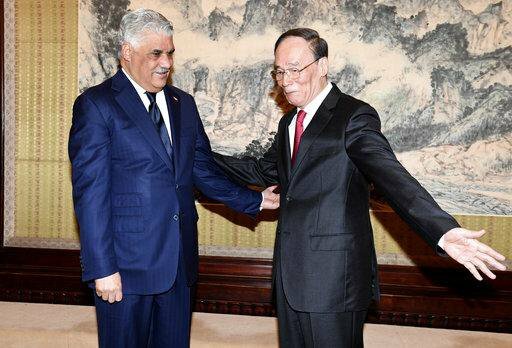 The Dominican Republic said it believed the switch would be "extraordinarily positive for the future of our country" and that it recognised Taiwan as "an inalienable part of the Chinese territory". "However, history and the socioeconomic reality force us now to change direction," he explained. The number of countries recognising Taiwan as a state has dwindled in recent years as China's diplomatic influence has strengthened. The last countries before the Dominican Republic to switch allegiance had been Panama last year and the African island nation of Sao Tome and Principe in 2016. China and Taiwan have been ruled separately since the end of the Chinese civil war in 1949. Relations between the two have worsened since the island elected Tsai Ing-wen as president in 2016. Ms Tsai has not formally endorsed the "one China" policy - an agreement in 1992 where both sides agreed there was only one China, but had different interpretations of what that meant. Beijing fears she will push for Taiwan's formal independence, but Ms Tsai says she wants to maintain the status quo. Since her election, Beijing has intensified its efforts to isolate Taiwan and persuade its supporters to switch sides. Given China's rapid growth as an economic and political global power, it has been increasingly easy for Beijing to sway countries to its side.